I've been working since June of 2016 to catalog my keyboard collection! 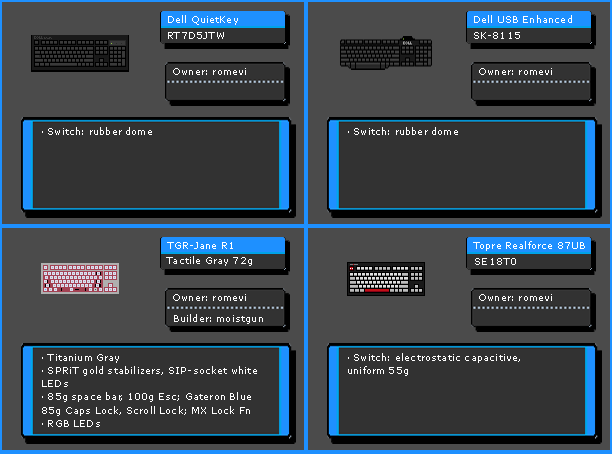 As of now, I've documented 233 distinct keyboards. This number is slightly off: the numbers either correspond to a box, or to a keyboard. When they correspond to a box, I have the problem that two boxes contain two keyboards, and one box is empty! Still, this is my best attempt to date to catalog my collection. Long term I'll be building a nice Web page with all of these. But for now I wanted to share these all with you in case I could answer some questions! Each keyboard (or box) has a three digit code. Please refer to keyboards by either the code ("099"), or XMIT plus the code ("XMIT099") outside of this thread. My earlier attempt at classification - UUIDs - was not great since that only tracked keyboards to a database entry, not a physical location. As of this writing I don't have a great database for all these boards. There are some real gems in here, including an FSSK, some M15s, and one very SAD board. Post if you find something you like! Nothing is for sale at the moment (well except for XMIT035 which is already in the Classifieds) but that could change. The little girl in the photos is my daughter. What boxes are you using? I've been looking for some boxes to organize some vintage boards I have. Right now I'm just using some usps boxes like you have for a few of your boards. Same as Uline's keyboard box, but much less expensive! Allocate about 3-5 minutes for each box to assemble (for 50 boxes that's about three hours...)! Impressive stuff XMIT! Looking forward to having my own hall effect XMIT board next month. In terms of organization chyros should take notes. Judging from his most recent videos he is sleeping on the floor. Thanks for the kind words guys! It took forever to get things in order but I'm so glad I did. Please let me know if you have any questions about a specific keyboard! XMIT, any comments on Fujitsu 3rd gen leaf spring vs. NMB HiTek Linears in terms of smoothness? Or is the XMIT Hall Effect still king? Ummmmmm, I think the mods need to add "keyboard collector" to your title. That is a killer collection. Many boards in there I would love to own, especially an 1800 of some sort. I'm biased! But Fujitsu leaf springs are very smooth indeed. Thanks! The mods are welcome to do so if they'd like. It's not the organisation that's the problem - my flat is just very small, and I have an enormous amount of keyboards. No matter how you organise it, at some point the space just runs out xD . HaaTa also has a small apartment or "flat". He makes excellent use of high ceilings, though. IIRC his are about 15 feet or about 4.5 meters high. 4.5 meters! damn, that sounds so blissful. would love to have high ceilings like that. anyway, OT: wow, must've been quite some work! wouldn't have expected photos of them all. edit: was fun seeing that tiny HHKB after seeing all of those old, vintage monsters. 129 is my favorite, what a beaut! didn't you have a beam spring? or did i just scroll past it? My ROOM back home is bigger than my FLAT here, to illustrate my point . Someone said something about a going away party for you. Did you finish your thesis? Are you done??? Yes, I finished by thesis a few months ago and did the defence just before Christmas. I passed with minor corrections, which I'm tending to now . I'll be leaving the UK around the end of February. My family is going to be quite... stunned... when they see just how many keyboards and keyboard stuff I've accumulated xD . Oh that's a really good deal riotonthebay! Please let me know what you think of the boxes, I may end up buying some more. What's the board at 101? I won a Goodwill auction for this one in July of 2015. I think some other folks here had their eye on this board and let me have it, for which I say, thank you! Daughter: "Daddy, is it true that there are kids in Africa that don't even have one keyboard?" XMIT: "Unfortunately, that's true, sweetie." Seriously, you collect keyboard like I collect calculators! AWESOME collection! Do I detect some inspiration for your name there? You have a very talented photographer; takes excellent pictures and is a hardware tester. Yep, that's it! Though if you look closely I botched a retrobright job on this one so the XMIT key is sort of faded. So sad!!! I'll have to make some new keys at some point. How long since you started collecting? Seriously, since about Feb 2015, but I've been into keyboards since middle school (the late 90s). A few Model Ms in that collection date back to about 2005 or 2010. I really should be shocked at the rapid rise of your collection in such a short amount of time, but in all honesty... I know exactly where you're coming from. I've really only been collecting calculators since 2010, more or less, so I can totally understand how a collection can rapidly balloon! Fun times! This is perfect for all my non huge boards (e.g. F122). To fit a full size Model M requires a slight modification: I cut off the first 2-3 inches of the side flaps on the top of the box so it closes a bit easier. A G80-3000 will fit with no trouble. Yes, I often cross post. I was stunned for a full minute just staring at the picture and wondering about all the goodness in there. Impressive. And I know something about tiny apartments away from home so cheer up Thomas, I feel you there. (This still an acceptable way to say "I'm sympathizing with you" right? That thread about 'keeb' and other slang monstrosities made me feel outdated). Your helper is cute and browsing your gallery was great. Thanks! My helper is a little bigger now. I don't feel so bad now about all the keyboards I've acquired in the past 2-3 months Although at this current rate I may have this many boards in a few years. Which switches do you like the most? Hard to say what my favorite keyboards are. More like, there is something about each of them that I like, and they all have inspired parts of the boards I'm designing. Favorite switches, that's a bit easier. In no particular order, the XMIT Hall switch (of course), Topre with factory damping, "Nopre"' (Noppoo/Plum/Royal Kludge) 55g, capacitive buckling spring, and middle weight vintage Alps with tall switch plates (brown, orange, blue). Vintage MX Clear gets an honorable mention in there. Phew! But again, all the switches have some nice properties, it's hard to pick a favorite. I've got a Realforce XF01TS out at the moment but I change out boards often. Do keyboards get a rotation? I only own a few (5-6) but find myself using 1-2 boards 90% of the time. Yeah I switch stuff out all the time. I had my F107 on my desk last week. With all those keyboards you certainly should be switching, for them not to add more dust layers. Well most of them are in boxes, that helps greatly. No, I really need to start moving some. Send me a PM and I'll see what I can do. Part of the problem is that it's easier to buy than to sell when you're short on time like I am. Once Round 2 stuff settles down I'm going to take a long hard look at what I've got and try to do some de-duplication. I do want to keep stuff on hand for meetups, ongoing research, etc. but I don't need so many Model Ms for example. Page created in 0.135 seconds with 75 queries.